Like its residents, McPeak's Assisted Living only gets better with age. The family owned and operated assisted living facility, based in Patchogue, New York, is celebrating its Diamond Jubilee this year. 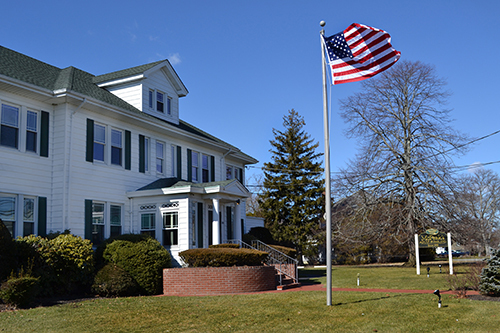 Founded in 1956 by registered nurses, James and Katherine McPeak, the Long Island adult care home has an extensive history of providing exemplary senior living services. The licensed facility includes a staff of efficient and compassionate individuals devoted to caring for the elderly and disabled, while the nearly 100-year-old home boasts the most modern amenities, safety features and updates. This is due in part to the 2009 "green living" renovation in which the historic mansion was modernized for energy efficiency and furnishings were refurbished in an effort to reduce the home's carbon footprint, all the while keeping the charm of the house intact. The family continuously updates the home to ensure its residents have access to the most state-of-the-art care and services. Set just blocks north of the heart of Patchogue Village's flourishing shopping and dining district, the home is surrounded by flowering shrubs and trees and features convenient access to the LIRR and Great South Bay beaches. The McPeak's family philosophy of care is based on the belief that it is their responsibility to preserve the health, safety and comfort of the aging residents in our community. To develop the mind, body and soul of its residents, McPeak's offers a variety of therapies, full-time recreation, exercise, delicious food and attentive staff. The daily schedule ranges from arts and crafts and games, to massage therapy, musical entertainment and gospel and is designed to attend to a person's needs in the quest for optimal health. "Our community is treasured by our residents and their families alike," says James McPeak, Owner of McPeak's Assisted Living. "We're so proud to be celebrating 60 years of excellent caregiving and paying personal attention to our residents' needs. It has been so great to carry on the legacy that my parents began 60 years ago and it is my hope that the McPeak's family continues to serve our local community for generations to come." Photo Caption: McPeak's Assisted Living facility.